Today is the 69th anniversary of the start of the Battle of the Bulge. Hitler’s last – and monumentally stupid – last gamble for victory in the Second World War…but showing that even an idiot, cornered, can still cause grief. We lost 19,500 dead in five weeks of battle. We lost 4,486 over the 9 years of the Iraq campaign. Some times, it does seem like we’re living in a different country. That we simply don’t have the courage and the leadership we once had. Its not that anyone is stupider – or more or less likely to make mistakes (the Battle of the Bulge was so costly mostly because of American mistakes, after all) – but that we don’t have the grit and determination to carry a thing to a conclusion. I wonder, given our current leadership (and this is not a slam at Obama, per se; he’ll be gone in the by and by – this is a concern about the whole lot of them, military and civilian from top to bottom) if we ever can or will fight a battle to a finish? Looks like we might be partnering up with al-Qaeda in Syria. More of that “smart diplomacy”. Spanish government, faced with protests, proposes anti-protest law. That will work well. A judge has ruled that NSA spying violates the 4th Amendment. Obama, if he were reached for comment, would say, “who cares?”. Its not like he’s obeying any of those tiresome, old amendments anyways. Slow-witted, hack Democrat woman Senator endorses equally slow-witted, hack Democrat woman for President. The President still hasn’t signed up for ObamaCare. Hope you are all having an excellent Holiday season – as for me, I’m enjoying Christmas time. Our current President will never need to sign up. He will have the best of care, doctors, and the best of pharmaceuticals for the rest of his life. Funded by the tax payers of the United States. Should some time in the future the tax payers run out of money and the Federal Government is unable to borrow any more money, the current President might just have to tap into some of that fortune he has amassed while in office. How a person goes from a net worth of way under a million dollars to over, iirc, seventeen million dollars, while in public office is beyond me. Being able to fight to the finish? Do not wonder on that part because the answer is most definitely yes. The fight is not the problem. The cost is. The longer the wait, the longer you take to get your own house in order, the more incompetence you put up with your so called leaders, the more it is going to cost you. You can not take two steps back then take one step forward and believe you have a winning strategy. You must stop going backwards first at whatever price. Then you go forwards. The longer the wait the more men and material you will loose. Just looking at the shape of the political landscape today, I believe the losses are going to tremendous. And there you have it—one source of his wealth is politics. Keep in mind this is based on his tax returns. or claimed income. We can always assume that none of that $635,000,000 that got assigned to Michelle’s old college friend and Barry’s new campaign donor has made, or ever will make, it back to Obama coffers. You know, the millions spent by the government on a non-functional online insurance information and sign-up system, to a company riddled with prior failures. Thank our Lord for saving us from global warming. This in my view is proof positive of the Glory of Jesus and the love he brings. 6 And all people will see God’s salvation. 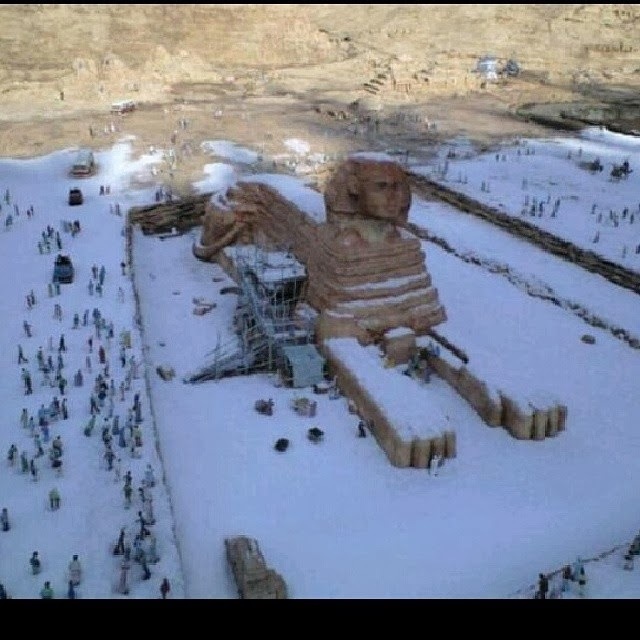 Snow in Egypt! A time of expectation and of waiting for the world for the increase of Light instead of the increase of darkness. A blessed Advent to all on B4V, especially to GMB and Neocon for their service during times of distress when good men wish for peace. Thanks to Mark, the Count and others for their service during times of relative peace and to Amazona and others for their hard work of the land to guarantee that America is the generous country that it is. It’s never a bad thing to God the glory! Thank you Jesus! I think we need to keep that sentence at the very forefront of any commentary about Hillary. That is, a constant reference to “progressive causes” over the decades and into where we are now. That is, eugenics, abortion on demand, defining abortion as the killing of babies even after they are born and viable, confiscation of property for redistribution by the State, weakening of our national defense and international reputation, the wimpification of our military, the narrowing of the definition of “choice” to mean only the choice to kill inconvenient children but not to extend to the choice of insurance plans, light bulbs, practice of religion, the choice to bear arms, etc. Let’s keep those “progressive causes” front and center, as they all include the inexorable and relentless expansion of the size, scope and power of the Central Authority and the erosion of our Constitution and its defenses of personal liberty. Say it loud and say it proud, Dianne. Keep reminding us. After all, we’ve been saddled with one failure of a president just because the Left claimed we needed a black one, so now according to Di we need a female one. After all, what could be a better criterion for electing a president than demographic identity? We lost 19,500 dead in five weeks of battle. We lost 4,486 over the 9 years of the Iraq campaign. What’s up with stiffing military retirees to tune of 6 billion! I guess they couldn’t find the 6 billion in cuts to government programs in waste, fraud and abuse out of 47 trillion, so we break our promise to those who serve. Shameful, not to mention weak! That’s just plain wrong Mr. Ryan and I expected better from you. Did you hear about the 50% increase in artic ice from last year? Thirty cm thicker too! Looks like another bad year for Al on his AGW tour. It’s been said, “the truth will set you free” or in Barry’s case, it may get you impeached! The truth does have a way of showing up at the most inopportune times for the grafter. Just ask Carney! Poor guy; I can’t help but feel sorry for him sometimes. God bless us one and all. Merry Christmas and Happy New Year! Any exit polling data you will find will show that Military personnel overwhelmingly vote conservative. But it was part of the Ryan-Murray Budget deal, and only Paul Ryan has defended this condition. Maybe the expression should be, keep your friends close, but your enemies closer. I would have have to say at this point, Mr. Ryan is also punishing his enemies. That is, as always, just my opinion. tell it to the author…...on DRUDGE , I merely posted it for informative discussion. The battle was won on the cross. This is not my home. What reason have we to fight the vanquished? Marriage does not belong to the man or the State, but to God. Who can ever challenge his authority? How can we resist that which cannot exist? I guess quotes from the Catholic church and it’s saints over the years fails the homosexual PC test. very sad. It was NOT a ********** “RANT” ********** or even a comment, it was an E mail I thought was interesting and re-posted especially with all the national controversy surrounding Duck Dynasty. enough is enough of WHAT?? current events, and news plastered all over the internet and the news?? You seem to be saying that moderators are homosexuals defending a PC position. Not so. Anybody heard from the Coffee Party lately? The No labels crowd? I would like to return some literature. Postage due if possible. Since we are on a semi-historical open thread I would like to mention that on (belated here but not by much) Dec. 15, 1791–The United States Bill of Rights becomes law when ratified by the Virginia legislature. Fortunately / Unfortunately, IIRC, I am pretty sure that on the same date the first US law school is established at University of Pennsylvania to find loopholes in that Bill of Rights thing. Well, its pretty clear that free speech obviously meant from the beginning “speech we like”. I do not have any way of even viewing the Duck Dynasty Television Show. I support Mr. Robertsons right to voice his opinions about homosexuality or any other subject he cares. If you are a Christian and believe as the Bible teaches, you should not only agree that Mr. Robertson has the right to say it but you should also agree with it. Join the million others. Link via Drudge report.